The piercing of the septum is probably the second most common piercing among primitive peoples after ear piercing; it’s even more common than nostril piercing. 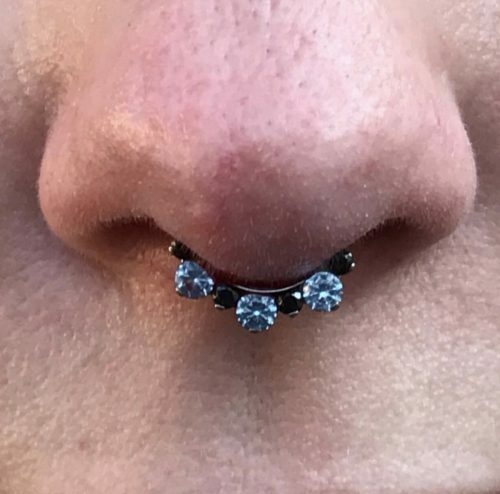 It’s probably so popular for the same reasons as nose piercing, with the added attraction that the piercing can be stretched and large pieces of jewelry can be inserted; i.e. pig’s tusks, pieces of bone, feathers, pieces of wood, etc. The septum piercing is particularly prevalent among warrior cultures; this probably has to do with the fact that large tusks through the septum give the face a fierce appearance. The use of septum tusks is very prevalent in Irian Jaya, New Guinea, and the Solomon Islands; pig’s tusks being the most popular. Among the Asmat tribe of Irian Jaya the most prestigious septum tusk is the “Otsj.” This is a large bone plug, which can be as thick as 25mm. They are usually made of the leg bones of a pig, but occasionally they are made from the Tibia bone of an enemy slain in battle. The Septum piercing was beloved by the Aztecs, the Mayans, and the Incas. They wore a variety of jewelry, but jade and gold were the most popular because of their religious associations. The modern day Cuna Indians of Panama continue this practice by wearing thick pure gold rings in their septum. The piercing is also popular in India, Nepal, and Tibet, a pendant “Bulak” is worn, and some examples are so large as to prevent the person being able to eat, the jewelry has to be lifted up during meals. In Rajasthan in Himachal Pradesh these Bulak are particularly elaborate, and extremely large. Additionally, Septum piercing was widely practiced by many North American Native tribes. The name of the Nez Perc, a tribe of Washington state, stem from their practice of piercing the septum: Nez Perc is French for “Nose Pierced” and was given to the tribe by the French fur traders. Australian aboriginals pierced the septum and passed a long stick or bone through the piercing to flatten the nose, they believed a flat nose to be the most desirable. Among the Bundi tribe of the Bismarck Ranges of Papua New Guinea the piercing is performed using the thin end of the Sweet Potato plant (Ogai Iriva), usually at age 18-22. The age at which the piercing is done varies greatly between different tribes; some tribes perform the rite at age 9-10. 12 gauge Clicker with Blakc and Arctic Blue CZ set in implant grade titanium.